It was 1983 and I was 13 years old. I had recently fallen in love with Doctor Who and wanted to learn more about the show. I stumbled upon a magazine celebrating the 20th anniversary of the show, and while I didn’t appreciate the significance of a science fiction series running for 20 consecutive years, I saw my opportunity to dive into the show and bought it on the spot. I learned more about the basics of the show, including exactly what the TARDIS was, where the Doctor was from, and why there was more than one Doctor–in fact, the one I had gotten into was the fifth and there were three I hadn’t even known existed! And the show was originally in black-and-white! 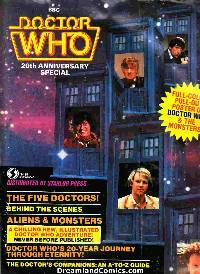 But the section of the magazine that made the biggest impression on me was the story guide, which gave a very short synopsis of every serial and a preview of the next season to come. I had already seen some paperback novelizations in the SF section of the bookstore with titles that sparked my imagination, like Doctor Who and the Pyramids of Mars and Doctor Who and the Tenth Planet, but this was a whole new game. Now I had a long list of imaginative and weird story titles, like “An Unearthly Child”, “The Web Planet”, “The Celestial Toymaker”, “The Tomb of the Cybermen”, “The Mind Robber”, “The Ambassadors of Death”, and “Carnival of Monsters.” The story synopses were short enough to let my imagination fill in a lot of blanks, helped along by the rest of the magazine, which gave just enough information about the series to give you the basics but still left a lot to be imagined. I’d never thought of a series of stories–or even chapters within one story–broken up like that, with evocative titles and summaries that hinted at colorful, mind-blowing adventures, but after reading that magazine ragged, I started loosely planning out comic book series, prose serials, and even tabletop RPG campaigns by coming up with titles that sounded cool to me, and then brief, broad story ideas inspired by the titles. I’ve been doing it ever since. Now I have a Google doc with a long list of titles for stories that don’t yet exist, seeds waiting to be watered and grow into real stories, powered by the potential of the imagination. This was written by josh. Posted on Wednesday, January 11, 2017, at 9:00 am. Filed under inspirations, theoretical lit, TV and film. Bookmark the permalink. Follow comments here with the RSS feed. Trackbacks are closed, but you can post a comment.